Holeb Pond, Holeb Public Reserved Land. Photo courtesy of Jack Heddon. The Holeb Public Reserved Land area consists of 20,000 acres in western Maine. The land is accessible via a private logging road north of Jackman. 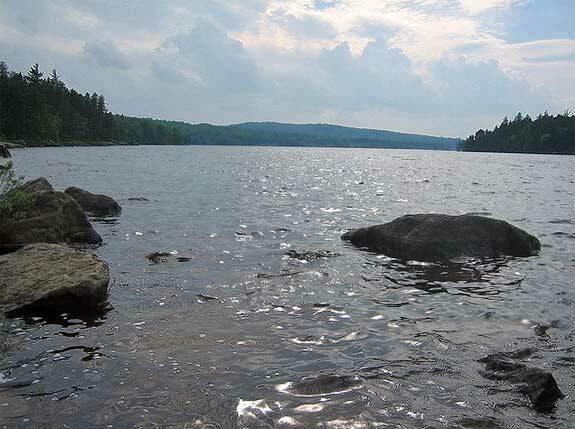 Visitors may also enter through the traditional portage trail leading from Attean Pond. Many visitors to Holeb take a three-day canoe trip, which passes through the center of the public reserved land. There are opportunities to run class I and II rapids, with the option to portage instead. One of the most striking features of the area is a beautiful waterfall in the center of the land area. There is a designated picnic area on a small island in Attean Pond. Primitive campsites are available throughout the unit. Entrance is free and the unit is open year-round. Call 207-778-8231 for more information.